Completely remodeled and updated 3-bedroom, 1 bath home is a must see! The first thing you’ll notice as you drive up is how sharp and vibrant everything looks. 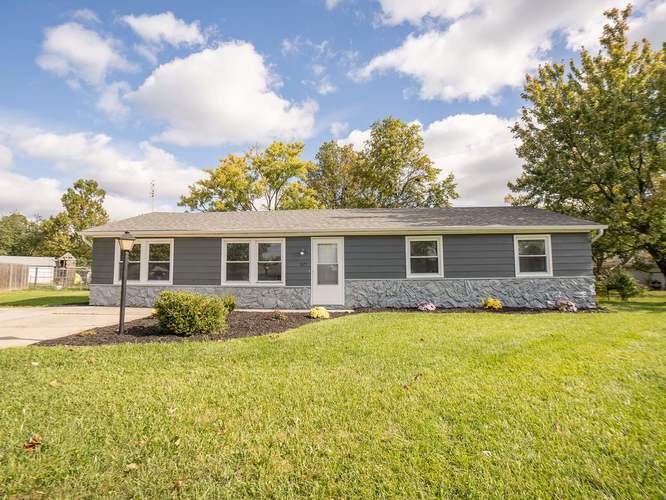 The house and free-standing shed were just painted a classy blue-gray with white trim, a new tear-off roof was added last year, and the updated landscaping pops with brightly colored mums. An extra-wide driveway provides ample room for parking, and a raised backyard garden bed gives you room to test out your green thumb. Inside the front door, a soothing blend of soft gray and white makes the home appear airy, light, and spacious. New flooring throughout includes new carpet in the living room and family room, and tile in the kitchen, dining area, and bath. Pure white beadboard wainscoting, white trim, brand new doors, and kitchen cabinets are the ideal accents for whatever decorative style you desire. The beauty is in the details, and new modern light fixtures provide the perfect amount of ambiance with an updated electrical box in 2006 and outlets supporting the system. The kitchen is stylish with brand new stainless steel appliances complimenting the silver cabinet handles, while the black countertops provide the perfect contrast point. The bathroom countertop is a beautiful mottled gray, and you’ll love the large white framed vanity mirror. With each thoughtful improvement, this house has become a highly desirable home — be sure to schedule your showing quickly, as it won’t last long! Directions:Travelling east on E State Blvd, cross Reed Rd, then turn left onto Camelot Drive. Veer right onto Berkley Ave then turn right onto Berkley Court. Home will be on the left.